This is truly one of the most amazing ads I have seen. It reminds me of O. Henry’s story ‘The Last Leaf’. In between, this is how genuine affection looks in a video. 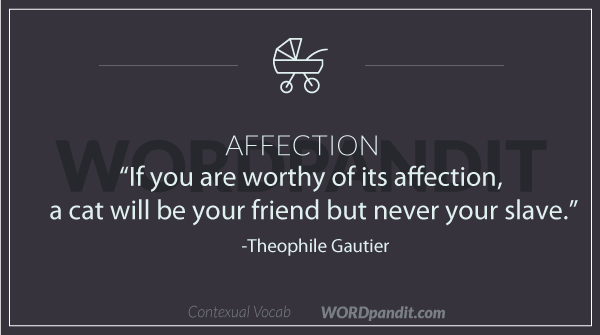 Affection is a feeling we all can associate with easily. The affection we feel for our parents or for our siblings or even for pets comes from deep corners of our hearts and is not something that can be valued materially. Add to this our childhood affections: the love for a certain candy, the craze for a certain video game, or the obsession with a certain film start. These are all the small ‘affections of life’ that we cherish forever. 1. A tender feeling toward another; fondness. 1. Her heart is too full of unselfishness and affection to allow a dream of fear or unkindness. Shouldnt it be: we ‘feel’ affectionate towards them?